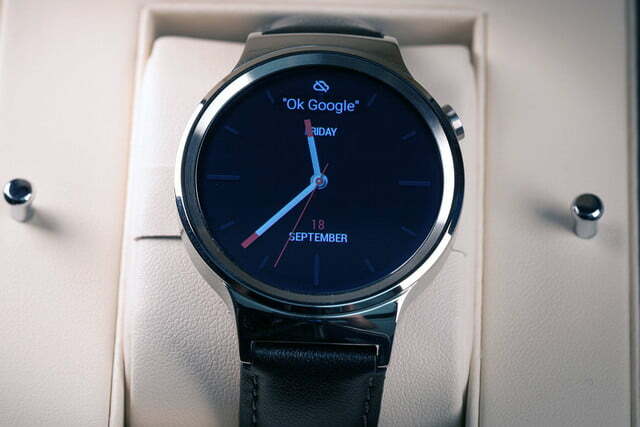 Sure it's sleek, but would you pay an Apple price for a Huawei watch? 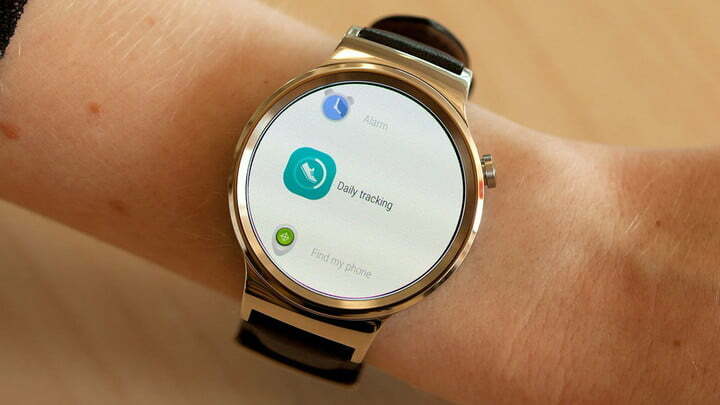 Huawei’s first smartwatch is a stunner with its sharp screen, sleek design, and the latest version of Android Wear. 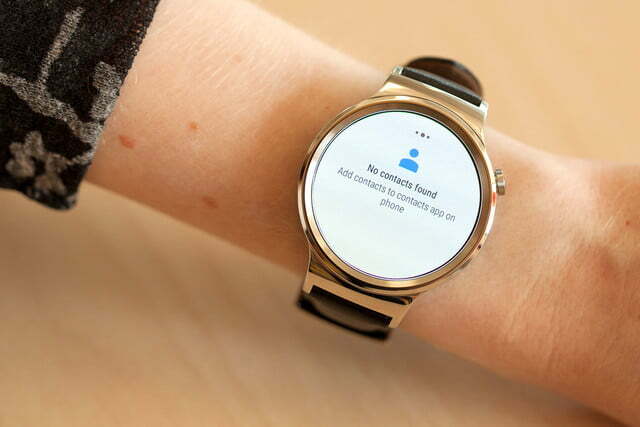 Android Wear smartwatches have come a long way since the first clunky LG G Watch. LG now leads the pack with its round-faced LG G Watch R and sophisticated Urbane, but attractive competitors are also starting to appear. The round Huawei watch, first teased all the way back at Mobile World Congress in February but now finally available to buy, is one of the most promising. Can it compare with the LG Urbane and the Apple Watch? ]Although LG’s Urbane and G Watch R both incorporate many aspects of high-end watches into their designs, but both skew heavily toward men. Huawei’s Watch instead strikes a middle ground between looking too masculine or too feminine. An array of different straps, metal options, and watch faces help it conform to different tastes. The 42mm watch casing is no chunkier than the Urbane, but it’s slightly thicker than the Apple Watch. Huawei wisely incorporates elements from traditional watches, like a crown for a power button, a sleek, stainless steel case, and a variety of straps. 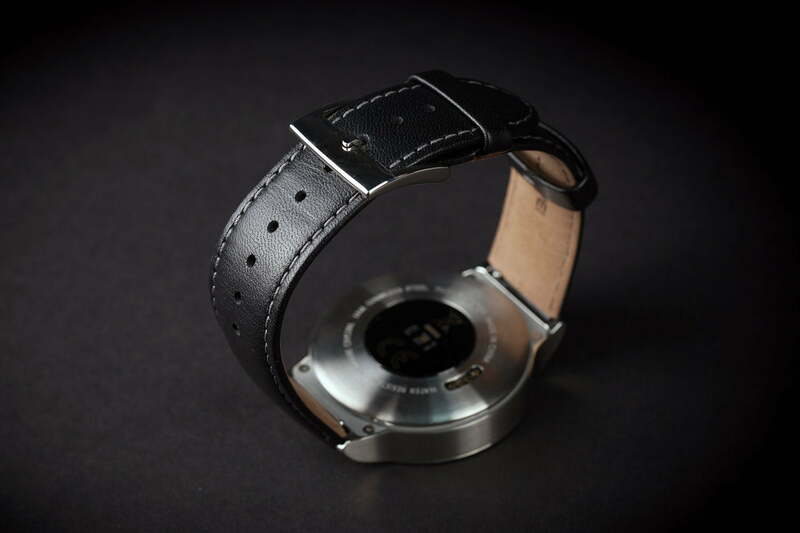 You can even use your own standard watch straps if you don’t like the leather, metal mesh, and metal-link options Huawei offers. The watch face is made from scratchproof sapphire crystal, which is supposedly even more impressive and hardy than sapphire glass. 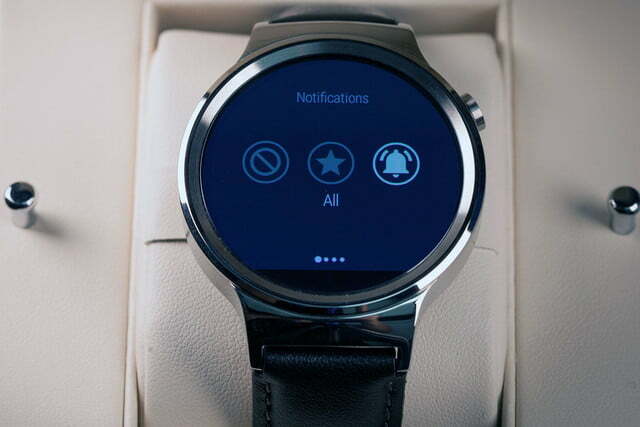 In addition to its good looks, the Huawei Watch is also pretty powerful. 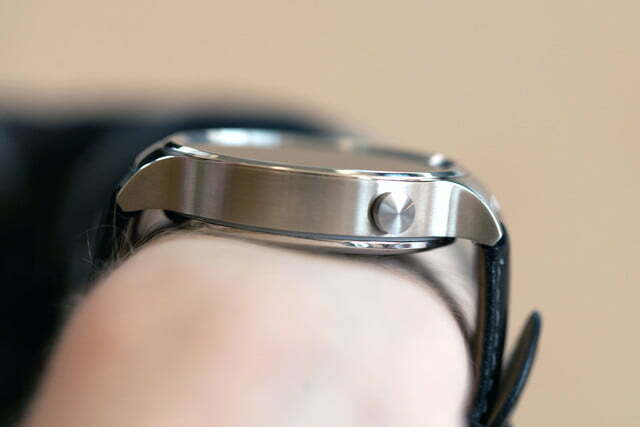 More importantly, the Watch has a round watch face that’s actual the correct size for the average human wrist. 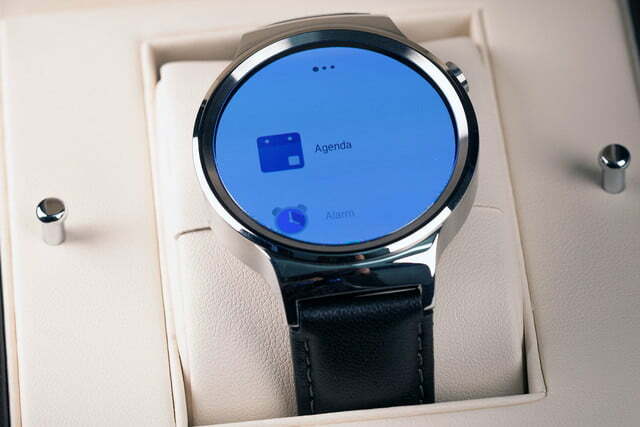 Huawei came up with the 42mm diameter and 1.4-inch AMOLED screen combination, which is similar to the new Moto 360 smartwatch, though the lugs are bulkier. The result is an attractive, round watch that settles comfortably on most wrists, but it still sticks out over the edge of my wrist more than the women’s Moto 360. It doesn’t dig into my wrist bones like most other smartwatches, though. It’s still a tad thicker than most ordinary watches, and it’s certainly not as dainty as the 38mm Apple Watch, but it can grace the average woman’s wrist without looking too outlandish. On men, the Huawei Watch looks even more natural, and thanks to its always-on display, you could easily mistake it for a normal wristwatch. Even on the smallest setting, the strap was too big for me, which let it slide up and down my wrist. 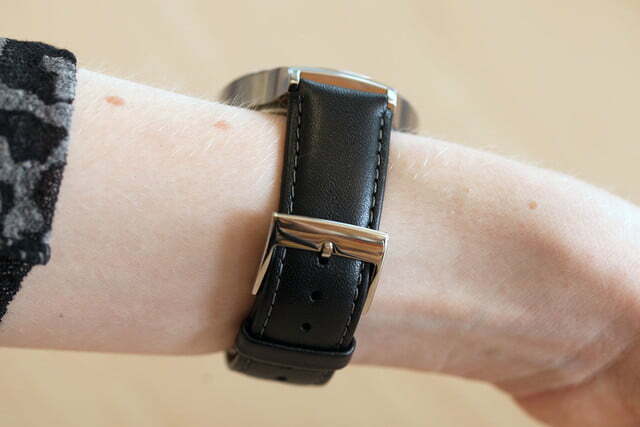 My review unit had the leather strap, but the metal strap I’ve briefly tried at trade shows seemed to fit better. Either way, I have to admit that the problem is mainly that I have abnormally small wrists. However, if Motorola managed to make one that fit me, why couldn’t Huawei? Regardless of my gripes, men will love the classic look of the Huawei Watch, and many women with larger wrists than mine will argue that it fits just perfectly. As with any wearable, it comes down to personal style. 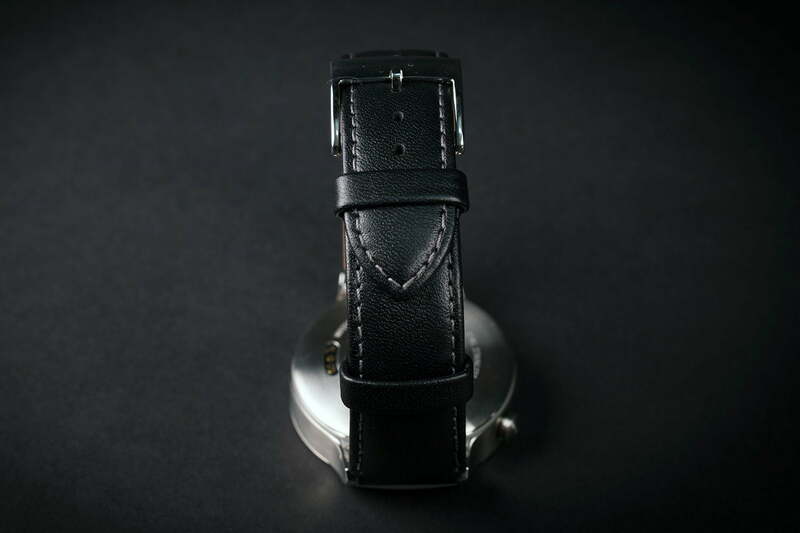 Luckily, the casing comes in black, silver, and gold, as well, to accommodate most styles. No matter the color, the casing is always stainless steel underneath. The most expensive versions of the watch can run you north of $700, but that’s because Huawei actually plated the watch case with rose gold. 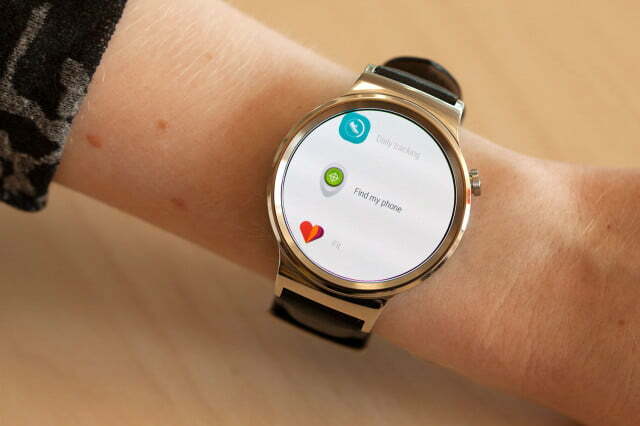 The only other smartwatches this customizable are the Apple Watch and the Moto 360, which has the Moto Maker store. 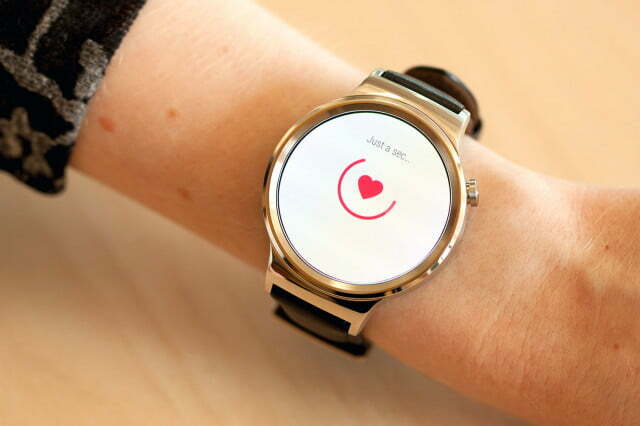 In addition to its good looks, the Huawei Watch is also pretty powerful. Its 1.4-inch AMOLED screen has a very high-resolution of 400 x 400 pixels, which gives it an impressive pixel density of 286ppi (pixels per inch). The crisp, bright look furthers the impression of quality that you get from the watch’s materials. This screen is always on, and you can choose from dozens of included watch faces, or download more from the Google Play Store. Huawei’s Watch reaches a middle ground between looking too masculine or too feminine. The watch sports a built-in heart rate monitor, too, so you’ll be able to keep tabs on your health, estimate calorie burn more accurately, and make sure your cardio workout is going well. 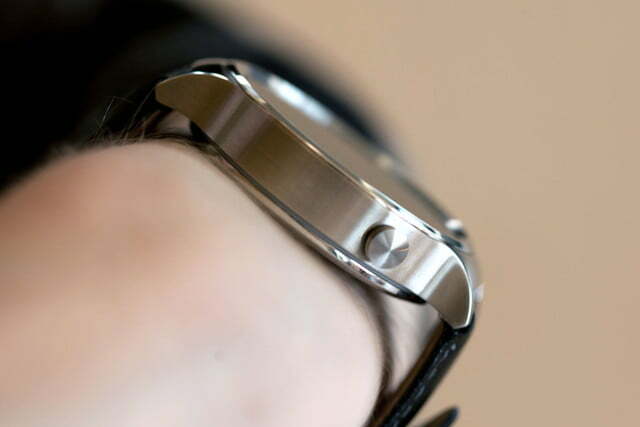 It’ll track your activity, thanks to a six-axis accelerometer, and your sleep, as well. The watch comes with 4GB of storage built in, 512MB of RAM, and Bluetooth 4.1. It’s powered by a Qualcomm Snapdragon 400 processor, running at 1.2GHz, so it’s quite speedy. We never experienced any lag, and the watch responded quickly. 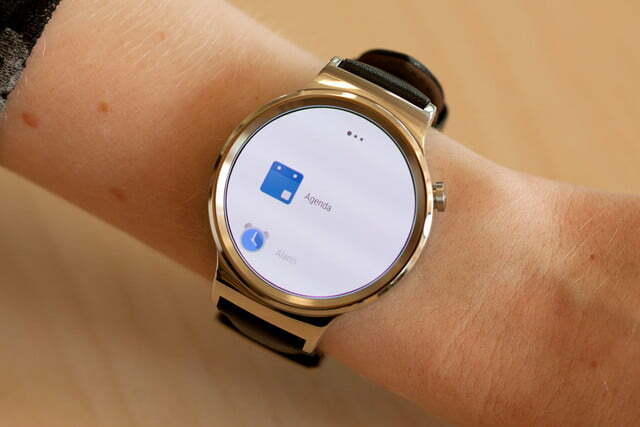 Although Android Wear is still not our favorite operating system for a wearable, the latest version of the software adds some cool new features and major improvements. It’s easier to navigate than before, offers Wi-Fi support, lets you draw emoji, and has an ambient mode to prolong battery life. You can even use it with an iPhone, which we did for a few days. It worked quite well, surprisingly, though many features were inaccessible on iOS. Huawei lets you choose which fitness app you want to use, but didn’t really interfere with the OS otherwise. Android Wear on the Huawei Watch is exactly the same experience you’ll have on any smartwatch that runs Google’s wearable OS. 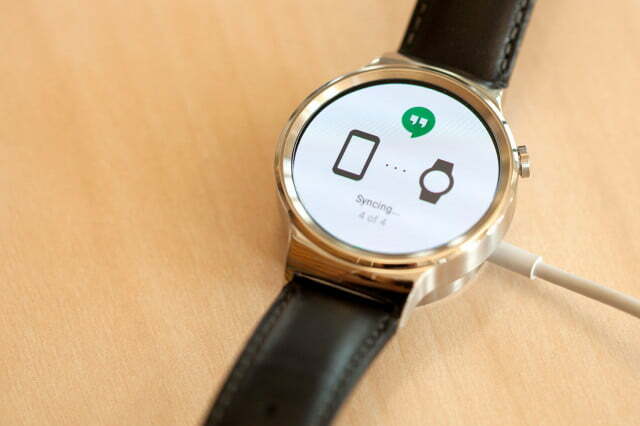 If you like Android Wear, you’ll love it. However, we think Samsung’s rotary Gear S2 interface and Apple’s Watch OS are easier to use overall. Huawei claims that the 300mAh, which is smaller than the LG Urbane’s 410mAh battery and the 320mAh battery in the Moto 360, a watch that had notoriously poor battery life. Still, Huawei claims its watch will last you up to two days, which would be a solid achievement for a smartwatch at this stage. Sadly, it doesn’t. Most of the time, it squeaked through a solid day, but on one terribly busy day, it died by 10 p.m. Like most smartwatches, you have to juice this one up every single night. Luckily, the charger is easy to use and charges relatively quickly, too. It looks just like the charger for the Apple Watch, except it has pin connectors. The Huawei Watch’s sleek design and attractive style options make it impressive to behold. Its performance is on par with every other Android Wear smartwatch we’ve tested, and the battery lasts through a day, but no more. The only sticking point that may give would-be buyers pause is the price tag. Want a new Huawei phone to go with your Huawei Watch? Keep your Huawei Watch safe from scratches with these screen protectors. If you’ve got the leather strap, but want a metal mesh strap to swap in and out, this 18mm strap will fit your Huawei Watch. The stainless steel Huawei Watch with a leather band costs $350, which is the same price as the LG Urbane and the Apple Watch Sport. If you want a metal band, the price climbs to $400. For the black version, you’ll pay $450, and if you like rose gold, you’ll pay the premium price of $700. Make that $800 for the one with a metal link strap, instead of leather. Apple undoubtedly inflated the price of smartwatches with its pricing scheme, but it’s unclear whether Android users are willing to pay that kind of premium for a smartwatch – especially from a relatively unknown company like Huawei. 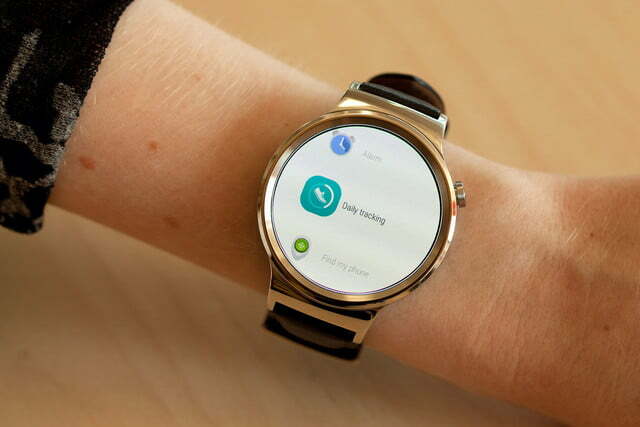 If you’re a woman, the 42mm women’s Moto 360 is the better choice. That said, until LG and others pop out new smartwatches with even better designs and spec sheets, the Huawei Watch is one of the best Android Wear smartwatches you can buy at the moment.